An interesting problem is to draw an eye-pleasing arc between two points. This can be used for anything from drawing origin-destination route arcs to approximating trajectories in animation. Since we already know how to interpolate a quadratic Bezier between three points, one possible solution is to parameterize the generation of a middle interpolation point given two initial points. I’ve used an algorithm along these lines since about 1982. It takes two parameters, one of which determines the concavity of the arc. The second parameter controls the distance between the midpoint of the line segment from first to last point and the middle interpolation point. This provides a large amount of control over the generated arc. A closely related problem is animating the arc. This is trivial with a quadratic Bezier as the section of arc at any parameter value can be drawn with a single curveTo command using deCasteljau subdivision. The auto-arc generation is now in the BezierUtils class and the subdivision method has been added to the AdvancedQuadraticBezier class. A screen shot from the rather plain and simple demo is shown below. The code has been checked into the Origin branch. If you’re in the D/FW area and are interested in attending Dallas TechFest, then I hope to see you at the session on computational geometry in Flex and Degrafa. Little knowledge of Flex is required; only a desire to add cool geometry buzzwords to your vocabulary. 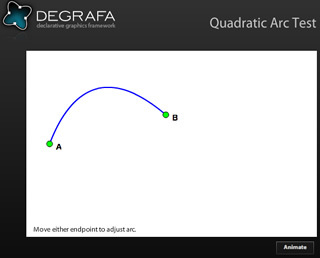 I’ll introduce Degrafa, highlight some differences between Degrafa and FXG, and then launch into the low-level computational geometry capability in Degrafa. In addition to declarative drawing, you can see how to perform more advanced tasks in Actionscript ranging from possible charting applications to animating route arcs. More on the conference below – see you at the end of July!